Cold weather is coming, and so is – pardon the 4-letter word – snow. Will you need to shovel that snow off your deck this winter? Click here for a surprising answer. Are you concerned that your deck may not be safe this winter? 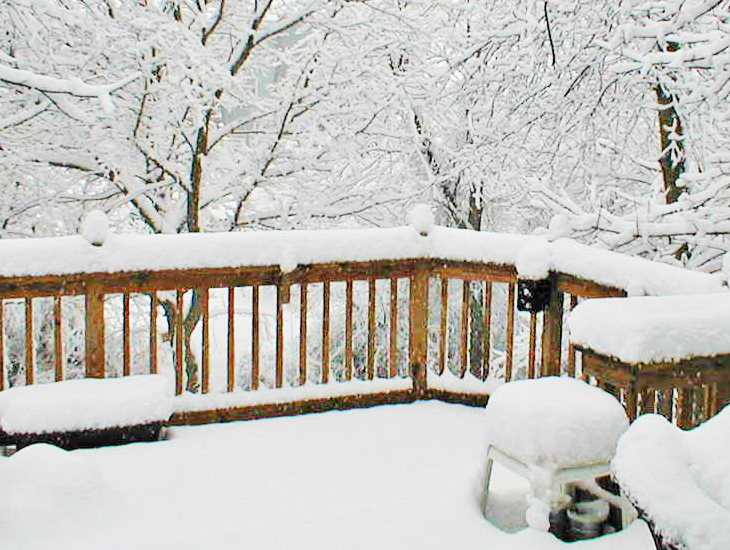 A minor issue in good weather (like a loose handrail) can become a major danger when snow makes your deck slippery. Are you worried that your deck may collapse under the weight of snow? Let’s begin with a quick safety check. Even if you are not a deck expert, you can learn a lot about your deck with just your eyes and some common sense. Decks are supported by a ledger at the house or by wood columns with concrete footings in the ground (or both). 1. Look under your deck. 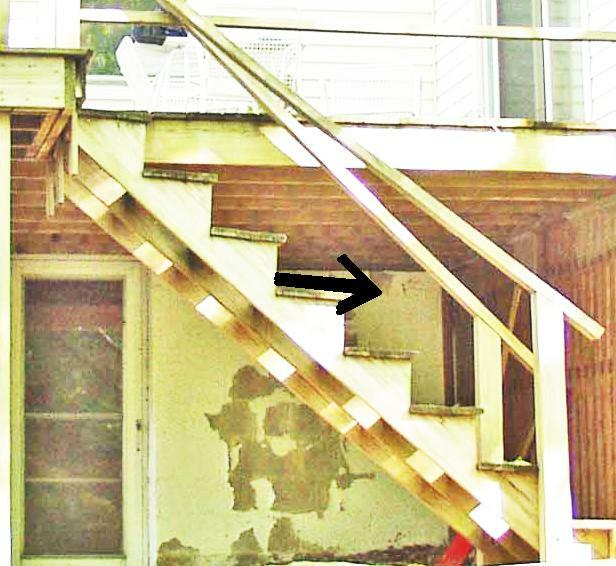 Most likely a deck ledger (or “band joist”) connects the deck to your house. Is it properly attached? This long board typically supports half the weight of your deck — and anyone on it. Most deck failures — catastrophic failures that seriously kill or injure people — occur when the deck ledger gives way. It should not be attached with just nails. Nails are thin, have limited holding power, and can easily rust. Your deck ledger should be attached with larger hex head bolts or ledger screws — probably two in each “bay” between joists. Link to my Deck Safety post to learn more about proper deck ledger connections. I apologize if some of my technical terms are intimidating; see a good explanation in my article about deck terminology. 2. Are the columns straight and solid? You can check with a level, or just look down the row of columns – are any misaligned? Are they firmly attached to the concrete footings? Do you even have concrete footings – or just some blocks or bricks or worse? 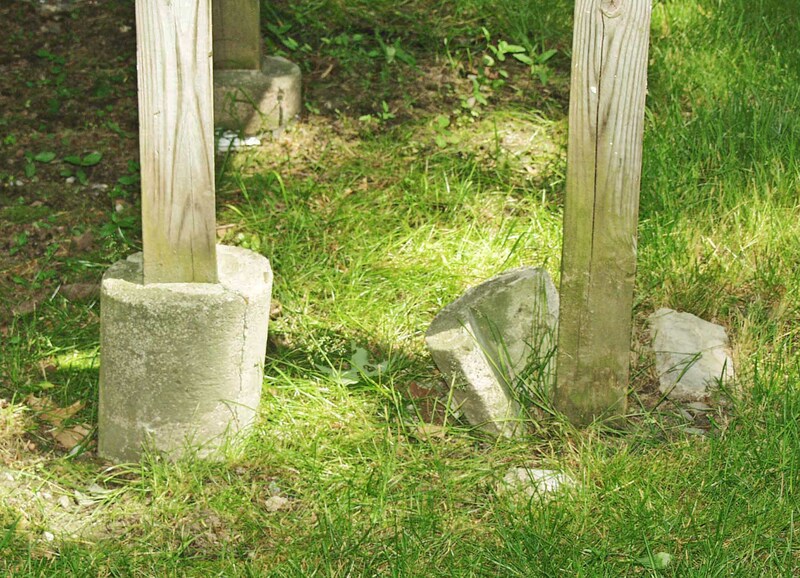 Your footings may be called upon to support 2,000 lbs or 3,000 lbs or more. 3. How solid are the rails – can you shake them easily with your arms? can feel uncomfortable when the treads you walk on are not level and slope downward. Put snow on that sloping tread and it becomes very dangerous. 5. Do your stairs have a solid handrail or “banister”? Anyone who slips on the snow will grab for that handrail. For a family member, a weak or poorly attached handrail is inconvenient, but for a guest it’s a lawsuit. 6. Do screws or nails stick up from the floor? They could catch your snow shovel or trip someone. 7. Is any part of your deck rotting? 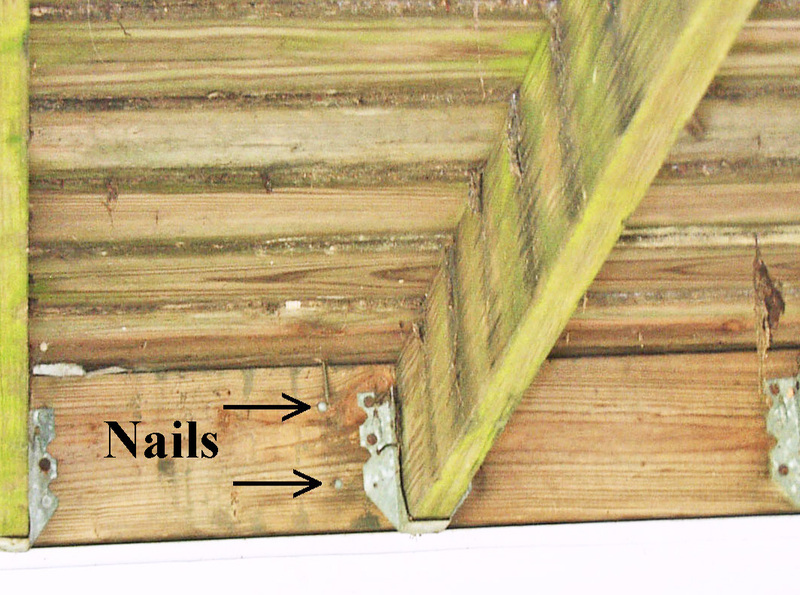 The deck frame should be built entirely of pressure treated wood and should never rot. The nationwide design standard for the weight a deck must support (beyond its own weight) is 40 pounds per square foot (psf). This “live load” standard refers to the weight of people and furniture, but it also applies to snow on your deck. If your deck is built to code, then, it will still be standing after your roof has collapsed from snow. Really. Permit me one quick aside, here. I live and build decks in Massachusetts, which used the nationwide 60 psf standard. In 2007, however, MA lowered the deck standard to 40 psf – even though the snow load standard in much of the state is 50 psf. Is it OK then for decks in the 50 psf zones to collapse? Perhaps if I were a state official, I could understand this. But I am just a deck builder, so I still build my decks to the 60 psf standard. Let’s get back on track: What does snow really weigh? Light and fluffy, dense and wet — snow varies. According to the authoritative American Society of Civil Engineers*, snow 36” deep has a design weight of 69 psf and an “Estimated Actual” weight of 36 to 54 psf. At 42” deep, the design load increases to 90 psf, and the estimated actual weight becomes 42 to 63 psf. Design loads are always conservative, so let’s use “actual” figures for our real world situation. Add some rain (at 5.2 lbs per inch) to 3ft of snow and the weight threatens your deck. Add even one inch of rain to 3 ½ ft of snow and the total load approaches 70 psf – a real danger to your deck. It may not collapse because of the safety margin built into construction standards**, but you’d be on thin ice (sorry). But enough engineering calculus. Is my deck safe? Here’s a rule of thumb: Your deck rails are probably 36” high. Don’t worry until the snow is above your rails. If you can see the rail tops, you’re OK — even with some rain. And shovel the snow off your deck only if you want a more comfortable path. Be careful not to slip! For tips about clearing snow from your deck, see my recent blog post. Ref: The Journal of Light Construction, April 2008, referencing ASCE-7 from the American Society of Civil Engineers. ** Design Standards in construction have a “safety factor” of 2.5 to 1. What does that mean? If laboratory tests show that a deck component breaks at 150 lbs, then it is deemed “safe” up to 60 lbs. This safety margin – between 60 and 150 lbs – protects us from real world issues: loose nails, knotty wood, etc. Your deck most likely will not collapse with 61 psf on it, but it definitely will collapse with 150 psf on it. At Advantage Design & Construction, we offer professional design and build services for clients west and north of Boston. Over the past 26 years we have designed and built over 950 projects, including more than 200 porches and sunrooms. We have enhanced the depth of our expertise by limiting our work to decks, porches, and sunrooms. To view some of these projects, visit our website. To learn how we treat our clients, check us on Angie’s List or read a recent article about us in Remodeling Magazine. For a free design consultation and a relaxed and rewarding experience, contact us via e-mail, subboston@archadeck.net or by phone, 781-273-3500. © 2010 Advantage Design & Constr., Inc.
Jim, Great info on snow loads. I think it is a good idea to keep the deck clear of snow during the winter for emergency exit but also, the weight of the snow building up can overcome the fasteners holding the ledger, particularly on older decks which probably were nailed, or the ledger is starting to rot. I saw a number of decks out west in Truckee, last winter where the ledger gave way and the deck went vertical! The snow falls and melts and falls and melts and the snow comes off the roof and adds to his load! As you say, this can easily overweigh the deck! Clearing an emergency exit path on your deck is certainly a good idea, Brice. And you are dead right about nailed ledgers being the cause of many deck collapses. Nails may have only 1/3 the strength of proper screws of bolts — at best. The majority of decks I see have nailed ledgers, and are vulnerable. The solution, happily, is inexpensive and easy: Add LedgerLok screws, 2 between joists (assuming the house has solid wood behind). LedgerLoks are available at most lumber yards, on-line, and even the “big box” stores; they require no pre-drilling, just zip them in with a power drill or screw gun. Truckee is in the California mountains — what’s the snow load there, Brice? I have a wooden deck. Is it better for the wood and long term care, to shovel the snow off the deck? Snow will not harm your deck, nor will snow melting to water harm your deck. Shovel off your deck if the snow exceeds 3 1/2 feet deep and you expect heavy rain. Shovel off your deck if you use it as a pathway. Shovel off your deck if you want the exercise. There is even a minor advantage to snow on your deck: it blocks the sun’s strong rays that would slowly steal the deck’s color. And if you do not shovel it, your shovel cannot scratch or dent the wood. So sit back, relax and enjoy all the work you are saving.